How best to collaborate on nuclear safety? Participating in the discussions with Carlos Alejaldre, Director for Safety, Quality & Security (far left) and Joelle Elbez-Uzan, head of the Nuclear Safety, Licensing & Environmental Protection Division (2d from left) are: Paola Batistoni (JET); Pierre Cortes; Sandrine Rosanvallon; Lorne Horton (JET), Damien Brennan (JET); Lina Rodrigo Rodriguez; and Christophe Seropian. 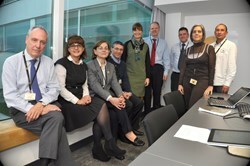 Nuclear safety specialists from the European tokamak JET and ITER met in November to discuss the possible ways in which the practical experience of one experimental device could serve the planning stages of the other. At JET, where 3,000 installable items and 16,000 tiles have been replaced inside the machine to equip JET with same materials mix chosen for ITER (beryllium and tungsten), the experiments underway since August 2010 are of interest not only to the ITER physicists, but also to the nuclear safety group at ITER. "A more systematic collaboration between our teams could only be beneficial for ITER," stresses Joelle Elbez-Uzan, head of ITER's Nuclear Safety, Licensing & Environmental Protection Division. "We have many lessons to learn from JET operation and design. Collaboration would allow us to extrapolate important parameters for the safety analysis of ITER, in complement to our established safety case." Joelle and her team are interested in all of the ramifications of operation with the ITER-like wall in JET, from the characterization and management of beryllium and tungsten dust, to in-vessel tritium retention and inventory, implications for worker safety during maintenance, and finally waste management. "JET is the only European tokamak that has already injected tritium into its vacuum vessel," stresses Joelle "and the JET team is planning a deuterium-tritium campaign beginning in 2017 or 2019 depending on the selected scenario. Their safety considerations—for machine design, fabrication and operation—are much like ours." During the meeting, potential areas for collaboration were discussed and agreed; in the coming months the ITER team will define and prioritize its specific needs. The type of collaboration to establish also remains to be defined. "Our colleagues at JET are very open to sharing their experience with us—there are clearly areas of mutual interest. Capitalizing on JET's experience in the domain of nuclear safety will be extremely valuable for ITER."